Published: Oct 8, 2018 · Modified: Apr 11, 2019 · By Jen Sobjack · This post may contain affiliate links. The weather is trying to cool down and the leaves are beginning to change colors. All I can think about is cranberry desserts!! A few of my favorite are cranberry orange upside-down cake, cranberry white chocolate oatmeal cookies, and cranberry orange scones. 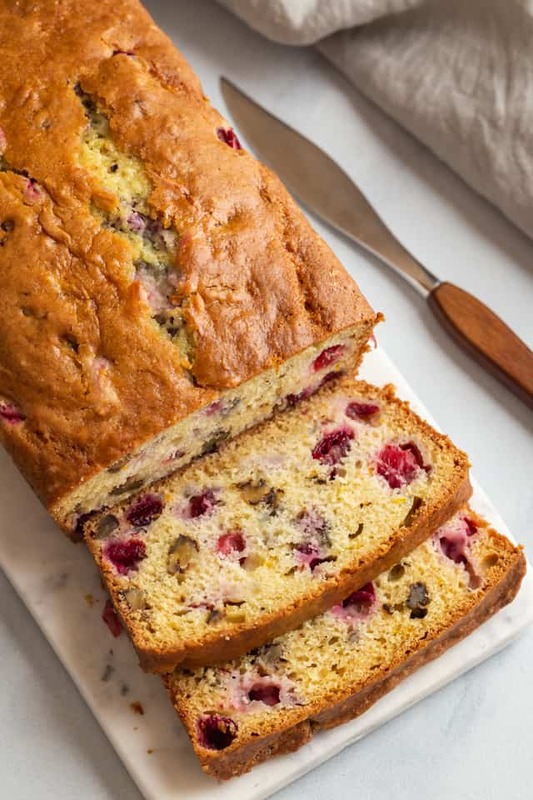 This cranberry walnut bread is so great for this time of year! It has a hint of orange and is dotted with tart cranberries and crunchy walnuts. It’s tender and very moist. 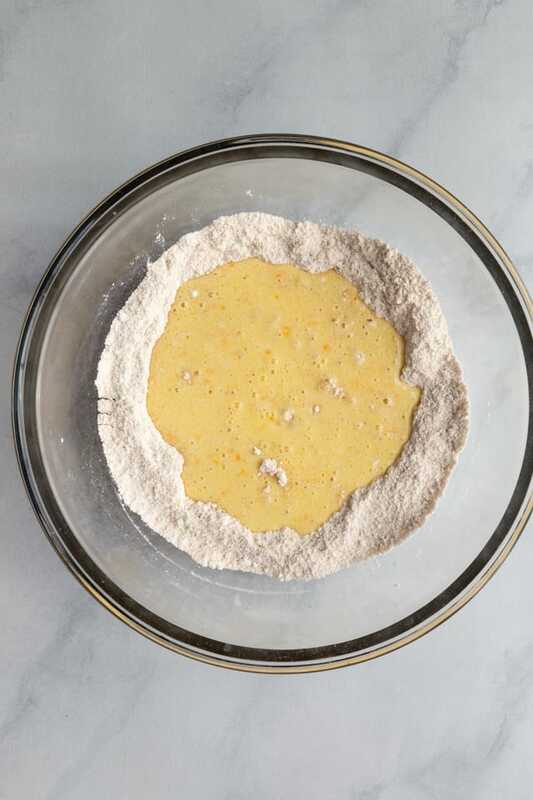 Like most quick breads, this recipe is made by mixing the dry ingredients separate from the wet ingredients then combining the two. The cranberries and walnuts are folded in last and the batter gets baked in a 9×5 loaf pan. I’m obsessed with this bread! Just look at that gorgeous golden color. What cranberries to use for cranberry walnut bread? Fresh, frozen, or dried cranberries all work great for this recipe! Fresh cranberries should be roughly chopped before adding them to the batter. Frozen cranberries need to be thawed first so they don’t leak excess liquid into the bread. Dried cranberries work great as well and can be added to the batter as is. 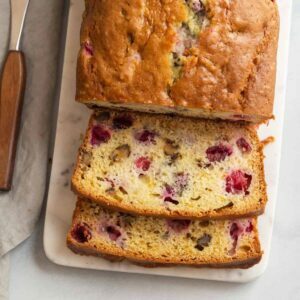 How to make cranberry walnut bread? 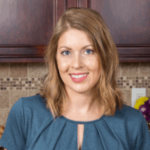 I love quick bread recipes because they are super easy! Simply mix all the dry ingredients together in a large bowl. Mix all the wet ingredients together in a separate bowl then pour it into the dry ingredients. Use a silicone spatula to fold everything together until no visible streaks of flour remain. Gently fold in the cranberries and walnuts. Be extra gentle if you’re using frozen and thawed cranberries. They’ll be quite soft and squishy which could result in turning the batter red. Or if you want streaks of red in the batter, you can be a little heavier on the hand. That would be lovely if you’re baking the bread for the holidays! And if you are not a fan of walnuts, you can leave them out or use a different nut instead. 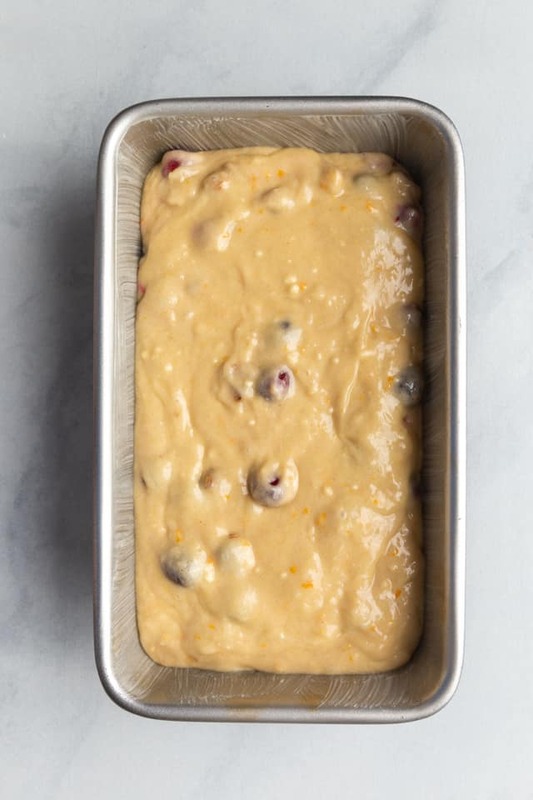 Transfer the batter to a loaf pan that has been lightly greased. I also like to line the bottom with parchment paper or drape a strip across the width of the pan and up the sides. This makes it extra easy to remove also. I’ve had times where the cranberries stuck to the bottom and I couldn’t get the bread out. So take the extra step and line the pan with parchment paper after you’ve greased it. The bread needs to bake for a good 55-65 minutes. The time will vary slightly depending on your oven. Start checking for doneness at around 50 minutes by inserting a toothpick into the center. The bread is done when the toothpick comes out clean. If you notice the top of the bread turning too brown before it has finished baking, you can loosely tent a piece of foil over it to prevent over browning. Allow the bread to cool in the pan for about 10 minutes before you try to remove it. Then set it on a wire rack to cool completely. Slice and serve the bread right away or wrap it tightly in plastic wrap and store it in the refrigerator for up to 5 days. I think the bread tastes best after it has sat for a day or two. It’s almost like the flavors have time to meld together. If you plan to use fresh cranberries, pulse them in a food processor just long enough to roughly chop them. 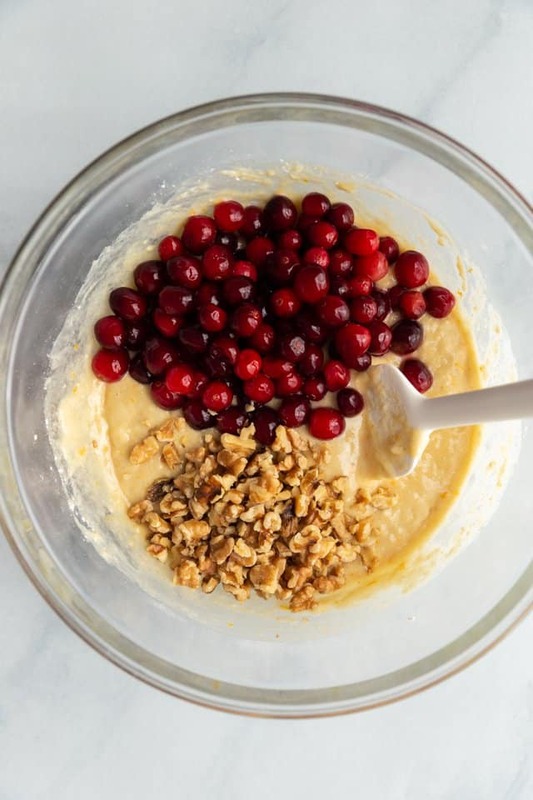 Be sure to thaw frozen cranberries before adding them to the batter. 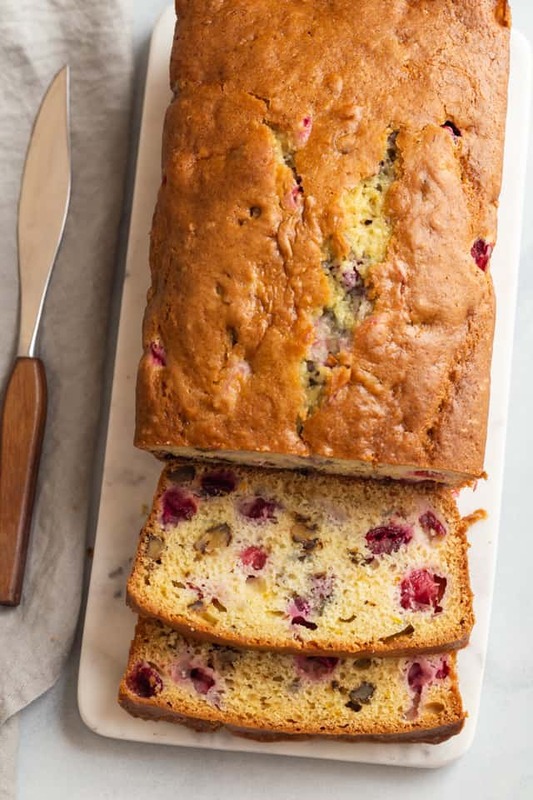 You’ll love how easy this cranberry walnut bread is! It’s a simple quick bread with orange zest, cranberries, and chopped walnuts. You can use fresh, frozen, or dried cranberries! Adjust oven rack to the middle position and heat oven to 350°F. Spray the inside of a 9×5-inch loaf pan with nonstick cooking spray. Place a wide strip of parchment paper along the width of the bottom of the loaf pan, and up the long sides. Set aside. In a large bowl, beat the butter and sugar together until light and fluffy, about 5 minutes. Add the eggs, one at a time, mixing well after each addition. Beat in the orange extract. In a separate bowl, whisk together the flour, baking soda, baking powder, and salt. Add half of the flour mixture to the butter mixture followed by the sour cream then the remaining flour mixture, beating just until incorporated. Using a silicone spatula, gently fold in the cranberries and walnuts. Transfer the batter to the prepared pan and spread evenly with a silicone spatula. Bake for about 55-65 minutes, until the golden brown and a toothpick inserted into the center comes out clean. Cool in the pan for 10 minutes, then transfer to a wire rack to cool completely before slicing and serving. The bread will stay fresh in an airtight container at room temperature for up to 2 days or in the refrigerator for up to 5 days. *frozen and thawed cranberries can be used if you don’t have access to fresh cranberries. Dried cranberries can also be used. Mmm delicious! I used dried cranberries which worked just fine. I also replaced orange zest for lemons, that’s all I had, and the flavors were lovely. I’m going to have to hide it from myself. 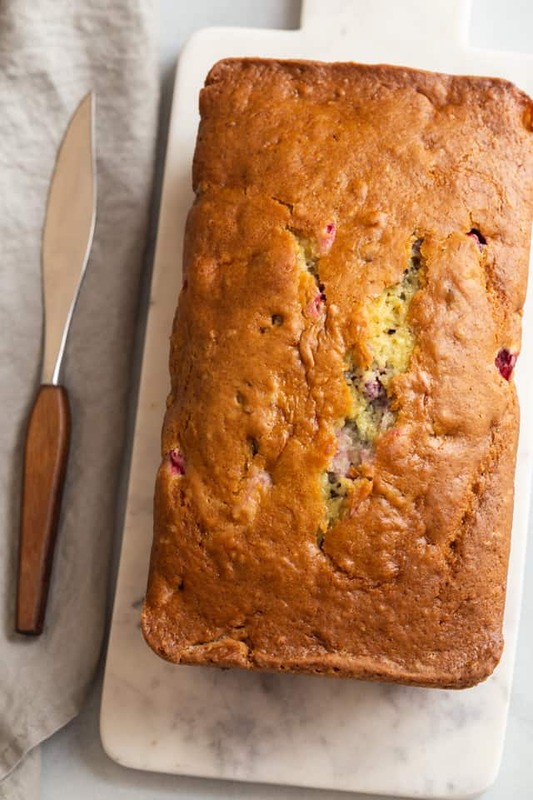 It’s great to hear it worked out with dried cranberries and lemon zest! 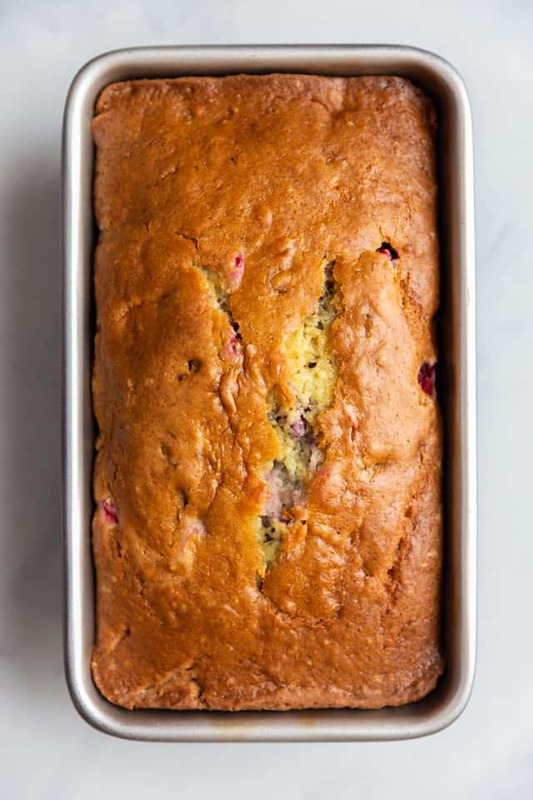 I love how this cranberry walnut bread has a hint of lemon! It’s exceptional! !